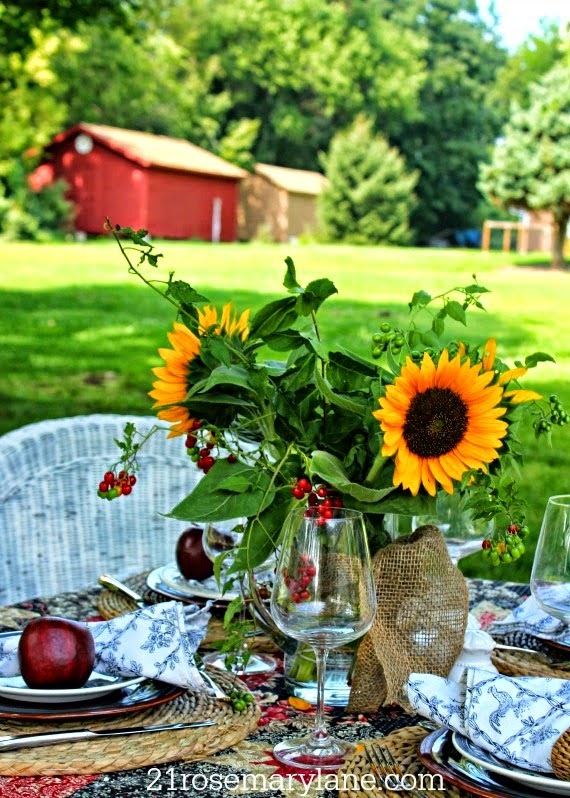 I've loved seeing all the inspiration at our garden parties. Garden tours are just as much fun as house tours! Clearly I'm not the only one who enjoys getting outside and playing in the dirt! We've started the fall clean-up around here. And you know fall is a great time of the year for planting too. I picked up a few new perennials this week and now we're going to need some new trees. We've had four white pines in our front yard for about 30 years. They were live balled Christmas trees from our early years in this house. Hard to believe they once fit in our living room! They provided shade, pinecones, greens for the holidays and a refuge for the birds. But after 30 years, they had totally outgrown their space. They also sustained quite a bit of damage from ice storms over the years. Taking pictures of our house and yard from different angles really helped put it all in perspective for us. It was time for a change! The trees obstructed our view of the neighborhood and it was hard to see the house from the street. Can you believe that street light used to shine in Megan's bedroom window when she was a little girl! I try to save every plant possible. But sometimes the best thing to do is just start with a clean slate. So yesterday the guys came out and in no time at all, the trees were gone! This little dove had to be relocated, but he's now been happily reunited with his mommy! I thought I'd feel a little sad, but I love how bright and open the front yard feels now. Even the light in the house feels completely different - like a breath of fresh air. I can't wait till the sun comes out again to really enjoy the light! So that's what's been happening in my yard. Any suggestions for new trees that work well in a front yard? 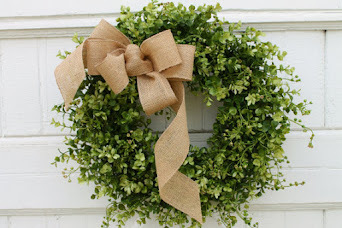 Spring blooms, beautiful berries, fall colors, so many choices! Robin from Happy At Home shared her favorite spot to sit back and relax - a charming gravel patio filled with collected pieces and the most serene and peaceful view! Can't you just imagine the crunch of the gravel underfoot? 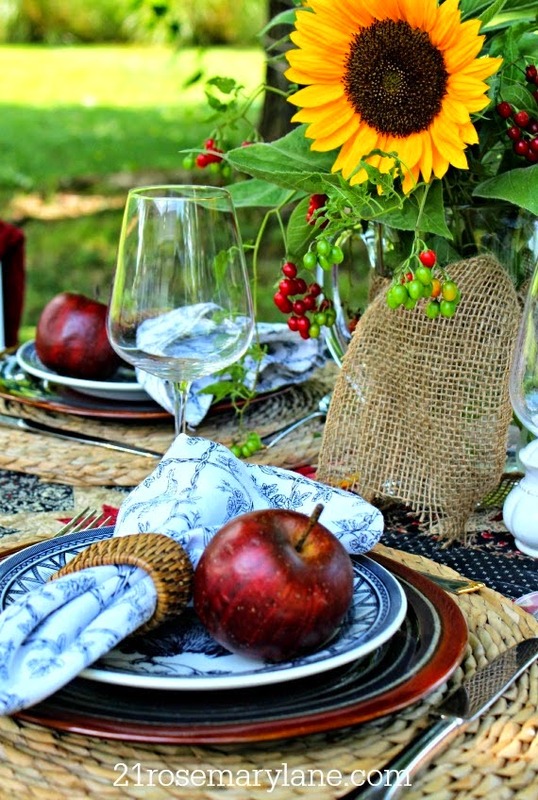 Barbara from Twenty One Rosemary Lane created a beautiful fall tablescape highlighted with apples and sunflowers. 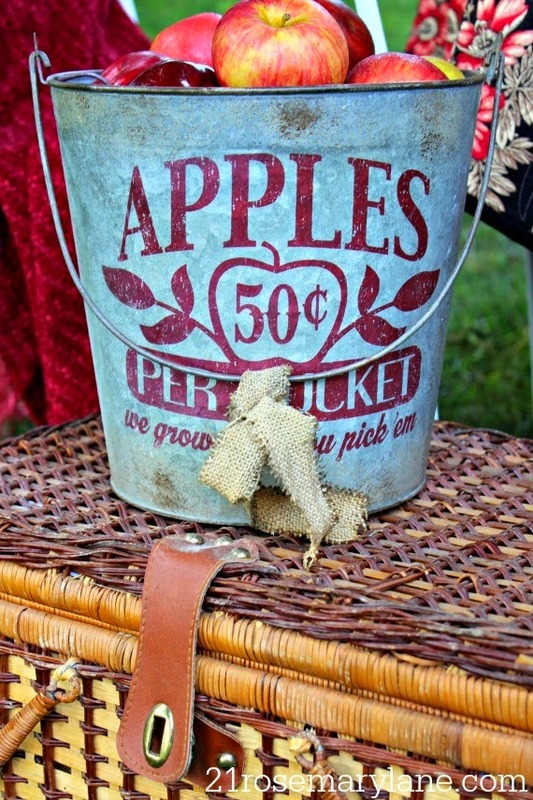 This makes me want to throw a fall party! 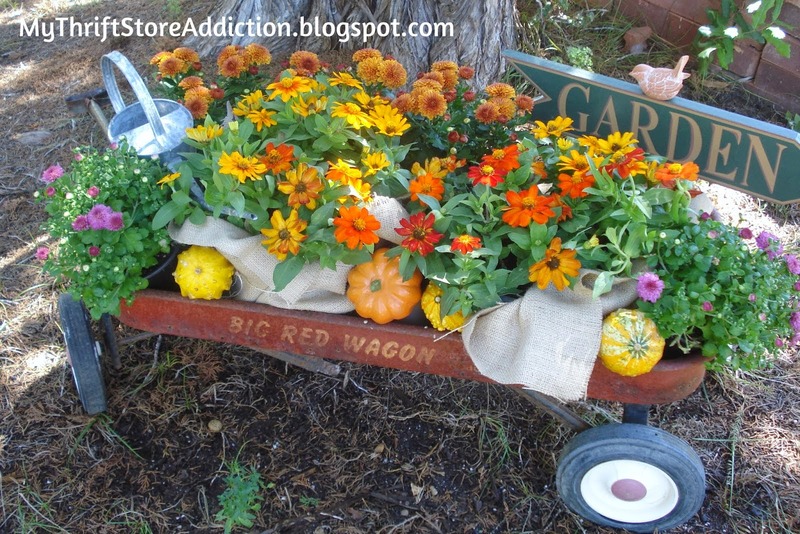 And Cecilia from My Thrift Store Addiction filled a little red wagon with fall flowers, pumpkins and gourds to create the sweetest fall display! Thanks so much to everyone who participated in our monthly garden parties from May through September. Let's do it again next year! it's been wonderful seeing such inspiration photos...the garden is the area i need the most help with, so the party is always good for that. As sad as it is to lose trees I really do like how it opened up your yard. We love our crab apples with PERSISTENT fruit (they don't drop crab apples all over). They don't get terribly tall- they are beautiful covered in sweet smelling blossoms in the Spring- lush and full small shade trees in the summer and have beautiful fall/winter interest with the berries there for the birds during the winter. I'm a bit sad that garden party season is over. :} But I love seeing your house! I can see your family room from the outside now. (on the end, right?) I loved seeing the view in pictures from inside those beautifully shaped windows, and now I know where they are from the outside. (I love figuring out floor plans.) And there's your famous garage where you do your painting. 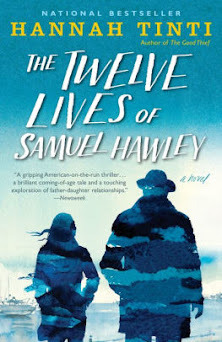 Fun to see it all! I absolutely love your house; it's so pretty! 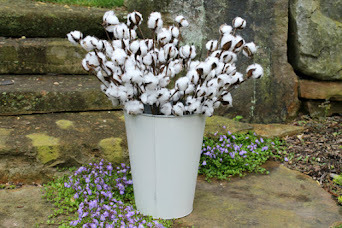 Sharon thank you so much for featuring my little backyard tablescape! How exciting it is to see my pictures on your beautiful blog...what a thrill. 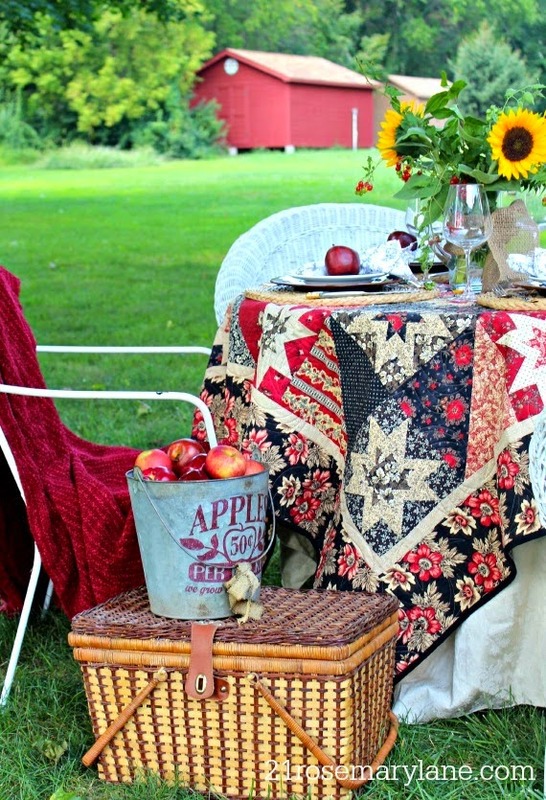 Love the idea of a gravel patio and that little red wagon with its fall harvest is just adorable. Looks like you made a good decision to take down the pines. I suggest serviceberries. They won't get too tall, have a pretty white bloom early in the spring, fruit the birds love in June and turn yellow with red highlights in the fall. Your house is beautiful! Never easy to cut a tree, but I can tell you have more light and a much better view. Right decision, Sharon.